IP (internet protocol) Telephony, enabled by softswitches, is going to usher in a new era in telecommunications. By putting voice and data over one IP network, operators can enjoy lower costs and create new, revenue-generating "multimedia" services. 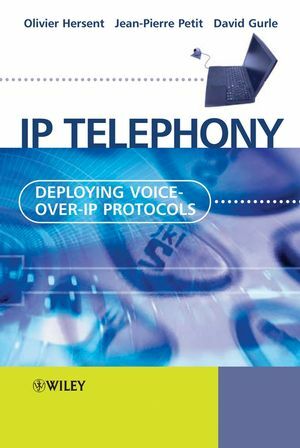 This valuable reference offers a comprehensive overview of the technology behind IP telephony and offers essential information to network engineers, designers and managers who need to understand the protocols and explore the issues involved in migrating the existing telephony infrastructure to an IP-based real time communication service. Drawing on extensive research and practical development experience in VoIP from its earliest stages, the authors give access to all the relevant standards and cutting-edge techniques in a single resource. Assumes a working knowledge of IP and networking and addresses the technical aspects of real-time communication over IP. Details specific strategies to design services for public networks where endpoints cannot be trusted and can be behind firewalls. Explores the problems that may arise from incomplete protocol implementations, or architectures optimized for private networks which fail in a public environment. This amply illustrated, state-of-the art reference tool will be an invaluable resource for all those involved in the practical deployment of VoIP technology. Olivier Hersent is Chairman and CTO of NetCentrex, France (Market Leader in VoIP deployments in Europe). Jean-Pierre Petit is Head of Voice Technology at France Telecom. David Gurle is Vice President of Multimedia Communications for Reuters and was previously Head of the Real-Time Communications (VoIP) group at Microsoft. 1.1 Transporting voice, fax and video over a packet network. 2. H.323: Packet-based Multimedia Communications Systems. 2.2 H.323 step by step. 2.3 Optimising and enhancing H.323. 2.8 Future work on H.323. 3. The Session Initiation Protocol (SIP). 3.1 The origin and purpose of SIP. 3.2 From RFC 2543 to RFC 3261. 3.3 Overview of a simple SIP call. 3.4 Call handling services with SIP. 3.5 Instant messaging and presence. 4. The Media Gateway to Media Controller Protocol (MGCP). 4.3 Sample MGCP call flows. 4.4 The future of MGCP 63. 5. Advanced Tpoics: call Redirection. 5.1 Call redirection to VoIP networks. 6. Advanced Topics: NAT Traversal. 6.1 Introduction to Network Address Translation. 6.2 Workarounds for VoIP when the network cannot be controlled. 6.3 Recommended network design for service providers. Netcentrex Companion Website This web site complements the two books published by Wiley: - Deploying VoIP protocols - Beyond VoIP protocols It contains some additional tools, updates that may have been posted on some chapters, and corrections of errata. Covers ALL the major VoIP protocols – SIP, H323 and MGCP. Includes a large section on practical deployment issues gleaned from the authors’ own experience. Supremely qualified authors with extensive experience in deploying VoIP networks. Chapter on the rationale for IP telephony and description of the technical and business drivers for transitioning to all IP networks. Accompanying web site with tools, tips and demos.